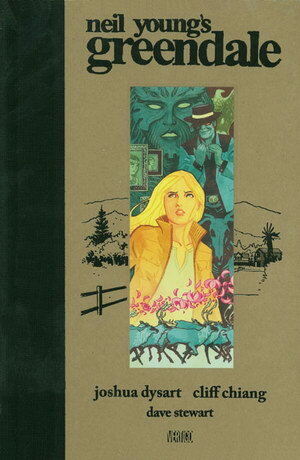 Greendale is the name of an album, movie and graphic novel by Neil Young. 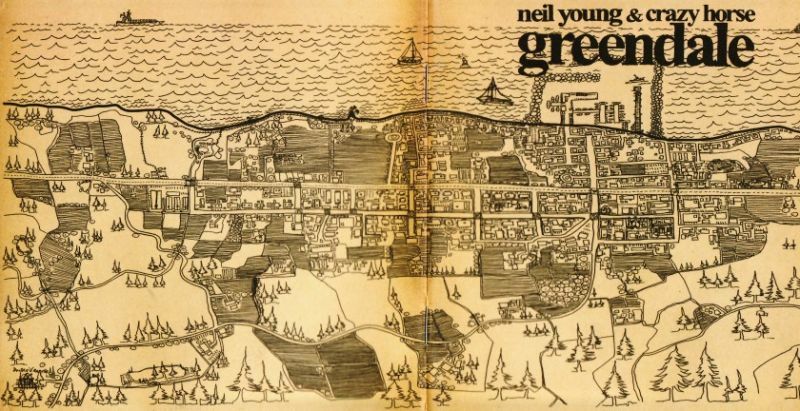 As the twenty-seventh album by Neil Young, Young and Crazy Horse’s Greendale, a 10-song rock opera, is set in a fictional California seaside town. Based on the saga of the Green family, the “audio novel” has been compared to the literary classics of Thornton Wilder’s Our Town and Sherwood Anderson’s Winesburg, Ohio for its complexity and emotional depth in exploring a small town in America. Greendale combines many themes on corruption, environmentalism and mass media consolidation. The album, concert, film and DVDs have produced a vast divergence of critical opinion ranging from being called “amateur” to being voted as one of the best albums of 2003 by Rolling Stone magazine music critics. The CD was originally released with a DVD of live “Neil-only” acoustic performance of the Greendale material from Vicar Street, Dublin, Ireland. In 2004, the CD was released with a new DVD containing a live performance of Neil Young and Crazy Horse. A DVD-Audio version was also released, with both Advanced Resolution Stereo and 5.1 Surround sound mixes, and a video of “Devil’s Sidewalk” from the film. In late 2004, the feature-length DVD with actors lip-synching the material was released. We include two albums from Spotify, the original Greendale and an official Greendale live album. I never understood the harsh critique of the album when it came out, I always liked it and even more today than I did in 2003. It really holds up, it is an impressive realization of Neil Young’s artistic vision. From music, to film, to concerts, to website and to graphic novel. This is a concept album in the broadest sense. I prefer the live acoustic solo album version.